In the third pAsuram, parAnguSa nAyaki‘s friends say “Though you would not withdraw from the pursuit of emperumAn as per our advice, would you give up over time, becoming weak?” she says “even the eternal time may end, but I will not give up until I see him”. Subsequently, parAnguSa nAyaki says “While trying to reach the most beautiful emperumAn and retrieve my bangles etc from him, even if you stop me saying ‘he is difficult to attain’ I will not give up even if the eternal time comes to an end”. Third pAsuram. parAnguSa nAyaki‘s friends say “we are not saying that engagement in bhagavath vishayam is inferior; though you would not withdraw from the pursuit of emperumAn as per our advice, you would give up over time, since he is difficult to attain; in that case, why not give up based on our advice?” she says “even the eternal time may end, but I will not give up until I see him”. gyAlam aRiyap pazhi sumandhEn nannudhaleer! ini nANiththAnen? nudhaleer – oh friends who are having forehead! en – what benefit is there? kaNdu koNmin – see this for yourself! 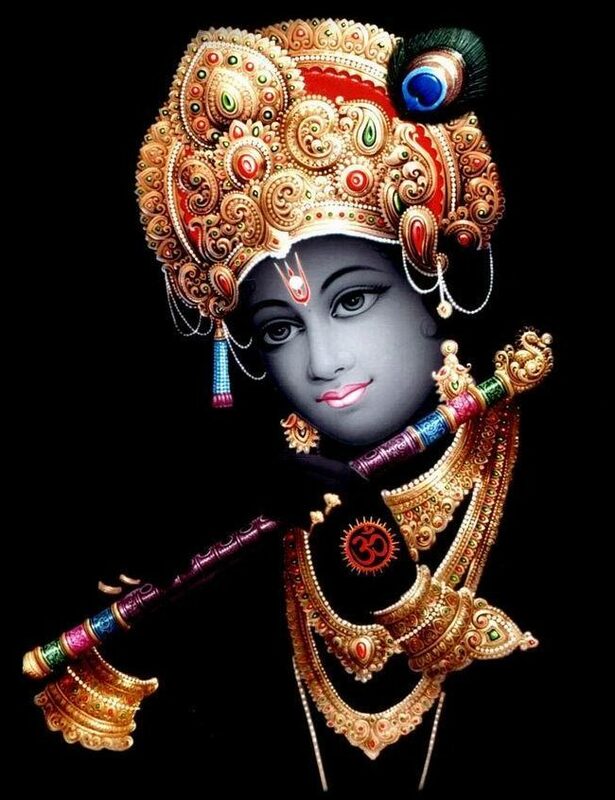 krishNa who is surrounded by a bluish, well blossomed, endless radiance and having complexion of a huge cloud, captured my attractive bangles and complexion; I acquired the blame by going with him forever to get them back, to be known by the world; oh friends who are having beautiful forehead! What benefit is there in feeling shy now? I who am having sin, will not give up becoming weak, even time becomes weak and perishes; see this for yourself! kAlam – Unless time which is said as in SrIvishNu purANam 1.2.28 “anAdhir bhagavAn kAlOnAnthOsya” (This time is huge and endless) ends, I will not become weak and give up. nAn iLaikkinRilan – Will I, who consumed with great desire, emperumAn, who is beyond time as said in SrIvishNu purANam “na kAla: thathravai prabhu:“ (Time is not the controller in paramapadham), give up? vinaiyEn – parAnguSa nAyaki is saying “I who am having sin to pursue emperumAn who is said to be difficult to attain”; or she is saying “I who am having sin which makes me remain deaf to your words”. kaNdu koNmin – Should we hear from others what is perceivable by us? gyAlam aRiyap pazhi sumandhen – Am I being blamed only today? Was I not blamed back when I said in thiruvAimozhi 5.3.10 “nAdum iraikkavE” (the whole world is angrily shouting)? nannudhaleer ini nANiththAn en – Should we not care for the beauty only until it is present? As this has become well known in the world, what is the benefit of feeling shy now? Now, she is saying that his beauty will not let us act as we please. neela malar … – Having bluish complexion. sOdhi sUzhndha … – To get back the attractive bangles and complexion which mesmerizes him who is surrounded by radiance, having the complexion of a huge dark cloud, making it available for others, I went along forever and was blamed by the world. Oh friends with beautiful forehead! What is the benefit in feeling shy anymore? eththanai kAlamum kUdach chenRu – Having pursued him for too long, to unite with him. This entry was posted in thiruvAimozhi, thiruvAimozhi 8th centum on February 11, 2019 by Sarathy Thothathri.